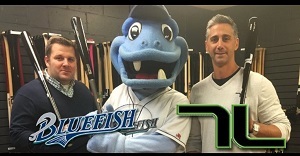 The Bridgeport Bluefish today announced that they have renewed their partnership with Tucci Lumber of Norwalk, Connecticut for the 2016 season. The locally-produced equipment will be the official bat of the Bluefish for the 2016 season. Tucci Lumber Owner and Founder Pete Tucci played college baseball at Providence College where he received All Big East, All New England, and All American Honors. In 1995, while playing with the Bourne Braves in the prestigious Cape Cod Summer Baseball League, he became the fifth player in modern era (post 1963) to reach double digits in both home runs and stolen bases. Tucci joins major leaguers Greg Vaughn (Cotuit '85), Albert Belle (Chatham '86), and Todd Greene (TD '92) in accomplishing this feat. Tucci was drafted in the first round by the Toronto Blue Jays in 1996. In 1998, he received the organization's Player of the Year Award, batting .318 with 30 homers and 112 RBI. As a Top 10 prospect and a member of the 40-man roster, he was traded to the San Diego Padres, where in 1999, he suffered a career-altering hand injury, resulting in a significant loss of power in his swing. After the 2001 season, Tucci retired with 84 home runs and 384 RBI in six seasons of minor league ball. Now, as a way to stay involved in the game that he loves, instead of swinging a bat, he makes them! Tucci Lumber bats are made from the finest maple and ash billets available. While many bat companies also claim to use the best wood available, quality does not end there at Tucci Lumber. Burnishing the bats with a hardened piece of steel ensures that each bat is as hard as it can possibly be. This process compacts the outer layer of wood, diminishing fraying of ash bats, and reduces seam marks and dents embedded in a maple bat. The result? A ball that "jumps" off the bat because, essentially, the wood doesn't "give"! Tucci Lumber provides truly customized bats, giving ballplayers the ability to design their own model. Selecting the knob, handle and barrel from any make or model gives you the ability to custom fit a bat tailored to your specific likes. For more information about Tucci Lumber, visit their website at www.tlbats.com.